The PHHAT team, courtesy of Alex Harvey. The Paddlers Hemlock Health Action Taskforce (P.H.H.A.T. 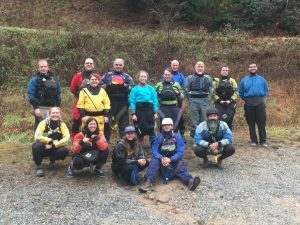 ), a collaboration between the Hemlock Restoration Initiative, MountainTrue, American Whitewater, and the North Carolina Wildlife Resources Commission, has received an $8,000 grant from the Perry N. Rudnick Endowment Fund of the Community Foundation of Henderson County. Congratulations to our partners and our P.H.H.A.T. paddlers! You can read more about the funding and the project in MountainTrue’s announcement here. To learn more about the P.H.H.A.T. team and how we’re helping hemlocks on the Green River, visit paddlersforhemlocks.com.